Bushiroad will be providing support this summer for three Cardfight!! 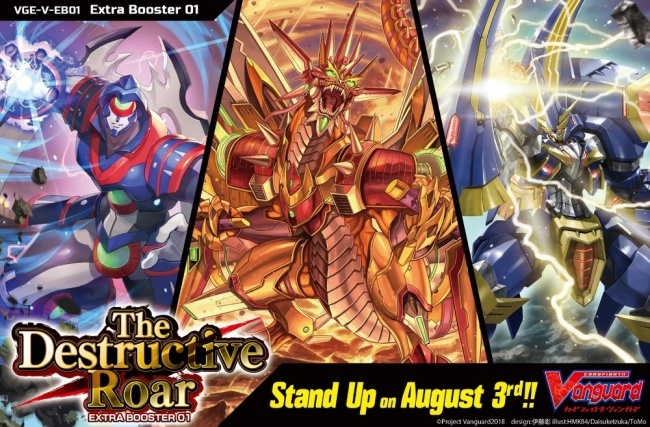 Vanguard clans in Extra Booster 1 � The Destructive Roar releasing on August 3. Cardfight!! 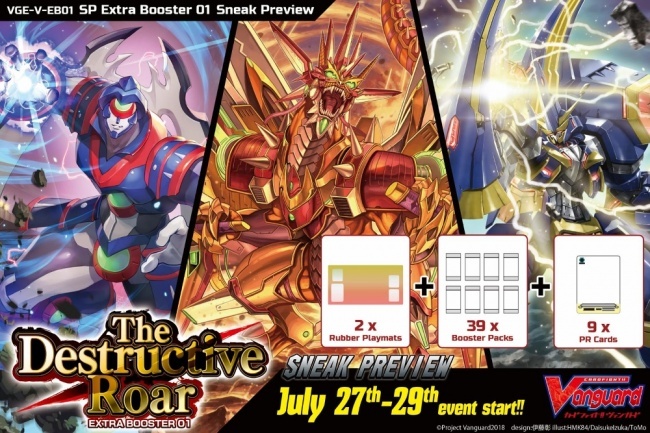 Vanguard: Extra Booster 1 � The Destructive Road features units from Spike Brothers, Tachikaze, and Megacolony clans, and for the purpose of deck construction , there are Trigger Units and First Vanguards included for each clan as well. The booster contains 66 types of cards (all new) including VR: 3 / RRR: 6 / RR: 9 / R: 15 / C: 33, + SVR: 3 [3 Parallel] + OR: 3 [3 Parallel]. Two cards in every pack will be R or above. Each booster display contains 12 packs, and each carton contains 24 displays. Preorder cartons will include one piece of each of the following cards: "Poison Sickle Mutant Deity, Overwhelm", "Great Villain, Dirty Picaro", and "Absolute Ruler, Gluttony Dogma." Each booster display will also include 1 piece of �Force,� �Accel,� and �Protect� Gift markers as well. A Sneak Preview Event will be held on July 27 -29, with a kit available to retailers to host events. The kit contains 39 booster packs, 8 +1 promotional cards, and 2 premium rubber playmats (1 design). Each kit supplies up to 8 players. Bushiroad is revamping Cardfight!! Vanguard this summer with the premiere of a new anime in May, and a new organized play format beginning in June "(see Bushiroad to Revamp 'Cardfight!! Vanguard'�).